As the lazy days of summer yield to cool autumn nights, we look ahead to embrace all that's scary and creepy. Whether you're just out to have some fun or learn something of the paranormal, Lewiston's Marble Orchard Ghost Walks showcase Lewiston's rough and tumble frontier past as well as its gloriously ghost-filled present. Lurking behind Lewiston's cheerful disposition lies an impressive past of creepy events, restless spirits and haunted buildings. 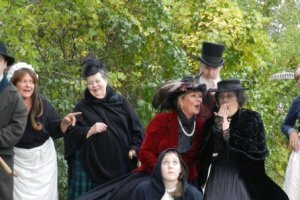 During the 90 minute walk, the Marble Orchard Players will take you back in time as they share ghost stories, myths and tales of tragedy, crime, mayhem and murder, the grim and ghastly deeds of Lewiston's best...and worst. Step back in time as these offbeat, theatrical guides walk you to the Village Cemetery. Rain or shine. No reservations are necessary. Oh, and bring a flashlight. It gets dark early in the cemetery!